The best-funded candidates for city council are often the WORST people to sit on city council. Before the 2013 election, City Council candidates in Grand Junction were largely self-funded, and no one had ever spent more than about $3,000 on his or her campaign. All this changed in the City election of April, 2013, when four seats on the seven-member City Council were up for grabs. To everyone’s suprise, the Grand Junction Area Chamber of Commerce jumped into politics, selected and groomed four candidates it sought to install on City Council and funneled $10,000 to $11,000 into the campaigns of EACH candidate, investing a total of over $40,000 in the City Council election. These were historic levels of funding for city council seats, and it came from very deep, anonymous local pockets.. No one had ever seen anything like it before in Grand Junction. The Chamber didn’t do all this in the open, though. Instead, wealthy Chamber members funneled their money into the Chamber’s then-newly created 501(c)-4 “social welfare” organization, the “Western Colorado Business Alliance” (WCBA), a dark money group that refuses to disclose its donors, to pump the chamber candidates’ campaign coffers full of cash. Rumor was that the owners of some of the biggest businesses in town — all chamber members — donated tens of thousands of dollars to WCBA and the Chamber’s effort to seize control of City Council. It was an ominous sign of what was to come, and most people were completely oblivious to it, until The Brainard Debacle. 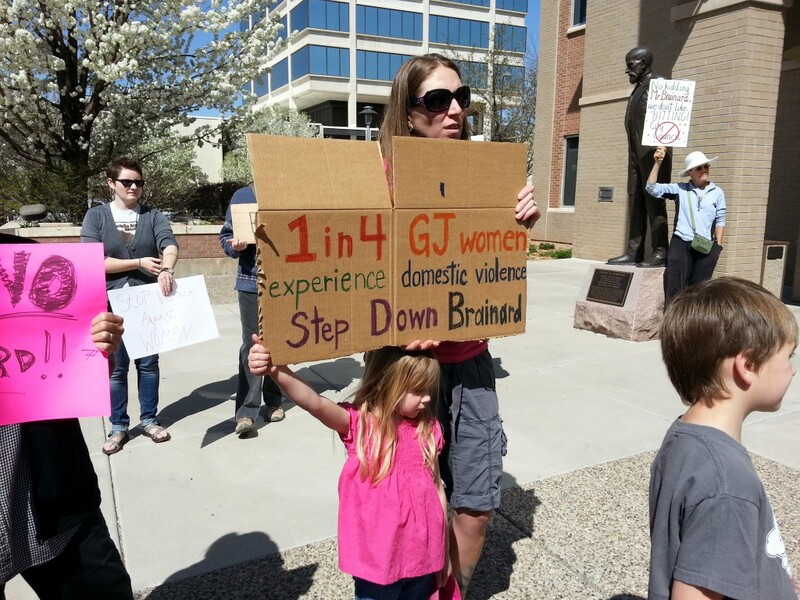 Grand Junction residents, especially women, howled in protest and were horrified to find a woman-beater had gotten elected to City Council. 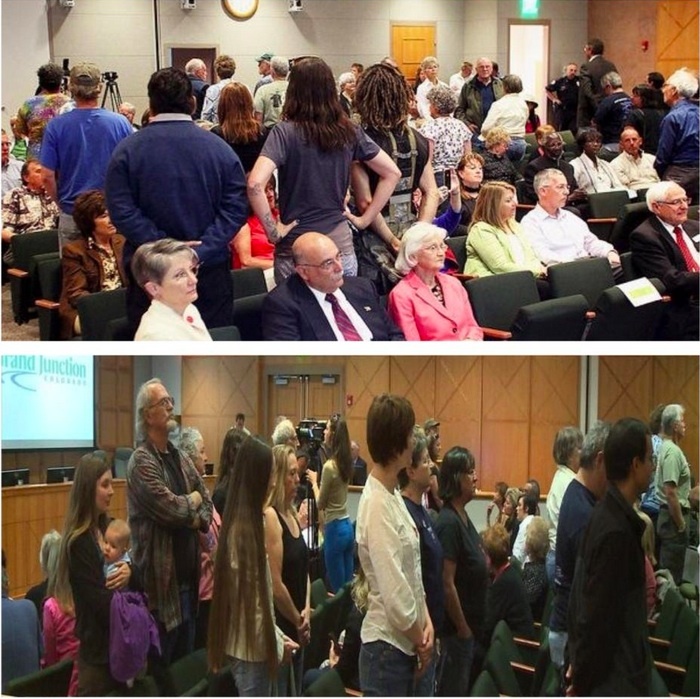 Two views of citizens turning their backs on Rick Brainard at his swearing in ceremony at City Hall Auditorium on May 6, 2013, the same day he pled guilty to 3rd degree assault for hitting his girlfriend and saying he had to do it because “she needed to shut her mouth.” OGREs are facing forward and are seated, and outraged “No Brainard” campaign citizens are standing. As spring turned to summer, pictures of Brainard wearing his yellow Mesa County Jail jumpsuit were shown almost nightly on the local news. Brainard was fired from his job at West Star Aviation, got pushed off several prestigious local boards and crowds of protesters regularly marched through downtown from the Chamber to City Hall and back, holding “No Brainard” signs and screaming through bullhorns for Brainard to step down from his seat on Council. In spite of all this, he staunchly refused to leave. 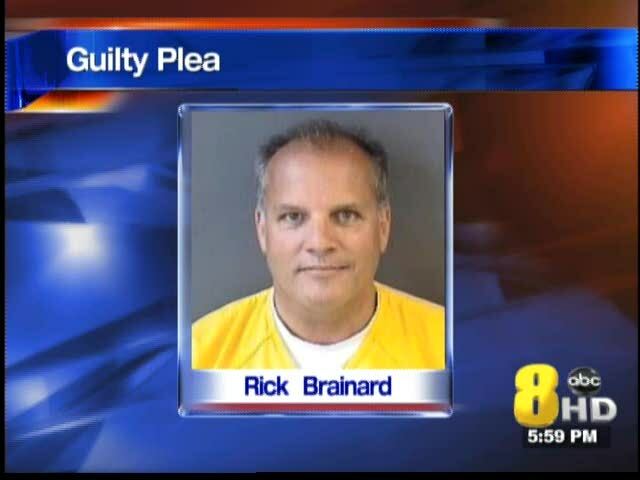 On May 6, 2013, Brainard pled guilty to 3rd degree assault at the Mesa County Courthouse and then sauntered over to City Hall Auditorium to get sworn into his seat on Council. Two-thirds of the audience turned their backs on him at his swearing in, but Brainard claimed to the TV news reporters that he didn’t even see them. To everyone’s horror, throughout the entire debacle, the G.J. Area Chamber of Commerce continued to back Brainard, and despite pressure from every direction, they refused to ask him to relinquish his seat on City Council. G.J. City Council candidates who amass huge amounts of money in their campaign coffers should be met with great skepticism. They are usually able to pull in so much cash because they have connections to the oldest, wealthiest, most entrenched members of the “Old Guard Republican Establishment” (OGREs) in town, and that of course includes the Chamber. OGREs are Grand Junction’s Great Preservers of the Status Quo. They own the biggest, most influential businesses, and work hand in hand with the Chamber to stop ballot measures that benefit workers, like minimum wage increases and paid family leave proposals. They’ve backed mind-blowingly inappropriate candidates for local office. (For example, in 2017 the OGREs backed a school board candidate who couldn’t even write. **) The OGREs cite mind-blowingly unqualified “experts” who reinforce their tightly-held ideology that measures to benefit working families, if passed, will doom society, and they often flat-out mislead people about ballot issues with crazy claims that aren’t founded in reality. Experiences like the Brainard Debacle, the North Avenue name-change debacle, the Downtown Event Center proposal/debacle, the tanking of the broadly-supported Colorado National Monument upgrade-to-a-national park proposal, the failed Brady Trucking rezone proposal, the Chamber’s large-scale gambling proposal, the Riverside Parkway Zig Zag Proposal and others have left a long and very clear track record showing that OGREs aren’t just kooky, but that their ideas are not what people want and are damaging to Grand Junction’s long term prosperity. By contrast, people with the least amounts of money in their campaign coffers tend to be regular working people who have far less clout, less influence and few to no connections to big business deep pockets. They tend to be good-hearted, hard-working types who scrape out a living like most people in town, and who see things through that lens. People who run for Council on a shoestring, who self-fund their campaigns at modest levels or who just get a few bucks from friends and family, just really want the City to start paying attention to the needs of working people and cash-strapped families for a change, and spend taxpayer money on things that have direct benefit to City residents and make their lives here better. They often have compassion and lots of common sense to boot. Ever since McCain chose the tokenism route in 08 with Palin, its all gone south. How hard is it to get back to Couric with the list of newspapers, stupid?? ?